This report describes a study to evaluate Geopier (trademarked name) soil reinforcement technology in transportation construction. Three projects requiring settlement control were chosen for evaluation?an embankment foundation, a box culvert, and a bridge approach fill. For each project, construction observations, in situ soil testing, laboratory material characterization, and performance monitoring were carried out. For the embankment foundation project, Geopier elements were installed within and around an abutment footprint for the new I-35 overpass at the US Highway 5/Interstate 35 interchange in Des Moines, Iowa. Although the main focus of this investigation was to evaluate embankment foundation reinforcement using Geopier elements, a stone column reinforced soil provided an opportunity to compare systems. In situ testing included cone penetration tests (CPTs), pressuremeter tests (PMTs), Ko stepped blade tests, and borehole shear tests (BSTs), as well as laboratory material testing. Comparative stiffness and densities of Geopier elements and stone columns were evaluated based on full-scale modulus load tests and standard penetration tests. Vibrating wire settlement cells and total stress cells were installed to monitor settlement and stress concentration on the reinforcing elements and matrix soil. Settlement plates were also monitored by conventional optical survey methods. Results show that the Geopier system and the stone columns performed their intended functions. The second project involved settlement monitoring of a 4.2 m wide x 3.6 m high x 50 m long box culvert constructed beneath a bridge on Iowa Highway 191 south of Neola, Iowa. Geopier elements were installed to reduce total and differential settlement while ensuring the stability of the existing bridge pier foundations. Benefits of the box culvert and embankment fill included (1) ease of future roadway expansion and (2) continual service of the roadway throughout construction. Site investigations consisted of in situ testing including CPTs, PMTs, BSTs, and dilatometer tests. Consolidated drained triaxial compression tests, unconsolidated undrained triaxial compression test, oedometer tests, and Atterberg limit tests were conducted to define strength and consolidation parameters and soil index properties for classification. Vibrating wire settlement cells, total stress cells, and piezometers were installed for continuous monitoring during and after box culvert construction and fill placement. This project was successful at controlling settlement of the box culvert and preventing downdrag of the bridge foundations, but could have been enhanced by reducing the length of Geopier elements at the ends of the box culvert. This would have increased localized settlement while reducing overall differential settlement. The third project involved settlement monitoring of bridge approach fill sections reinforced with Geopier elements. Thirty Geopier elements, spaced 1.8 m apart in six rows of varying length, were installed on both sides of a new bridge on US Highway 18/218 near Charles City, Iowa. 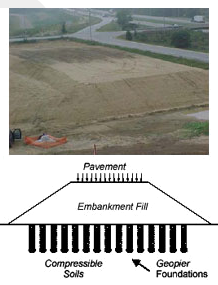 Based on the results of this project, it was determined that future applications of Geopier soil reinforcement should consider extending the elements deeper into the embankment foundation fill, not just the fill itself.